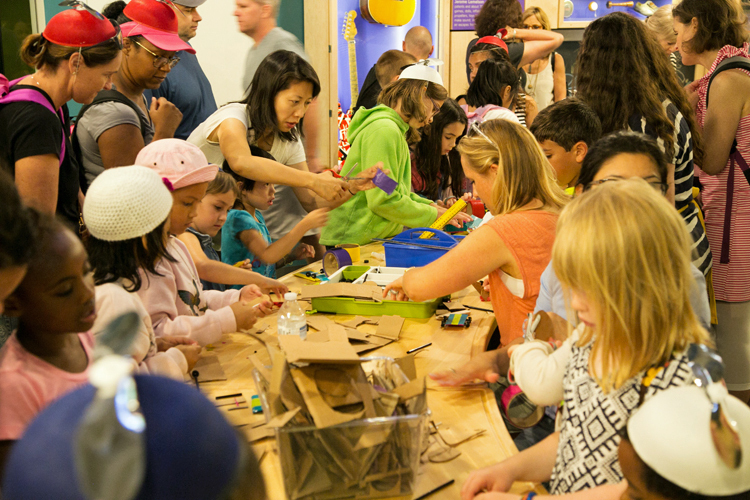 Welcome to the Draper Spark!Lab, the interactive space for kids (and adults) to explore the process of invention! Spark!Lab is open every day, except Tuesdays and December 25, from 10:00 a.m. to 4:00 p.m. We welcome visitors to explore our hands-on, self-directed activities on a first-come, first-served basis. Facilitators and volunteers are available to assist, engage, and experiment with our visitors, but are not responsible for supervising children. Please note, children under the age of 12 may not visit Spark!Lab without an adult. Spark!Lab does not take group reservations or appointments, however do we appreciate prior notification of your visit. You may email SparkLab@si.edu to let us know you are coming. Your group is welcome to visit at any time during Spark!Lab’s public hours, but please be advised that, due to space restrictions, we may not be able to accommodate your whole group at one time. If your group is larger than 10 students, consider splitting into smaller groups beforehand to visit other areas of the museum with proper chaperone supervision. We recommend that you allow about 30 minutes for a visit to Spark!Lab to ensure your group has time to explore all of the fun activities in the space. Upon your arrival to Spark!Lab, a facilitator will greet your group and assess how many children and adults can be admitted at that time. If we can accommodate your whole group at once, the greeter will orient you to Spark!Lab and provide a brief overview of what you can do during your visit. We recommend splitting into smaller groups once inside Spark!Lab to ensure that everyone has the opportunity to fully engage in the activities. If the space is busy and we cannot accommodate your whole group, we will ask that you split into smaller groups and take turns visiting Spark!Lab. Facilitators will be on hand to assist, engage, and experiment with your group, but the responsibility of supervising the students remains with you and the chaperones. Activities are all organized under a theme, but there is no order in which they need to be completed. You can start anywhere! Ask a facilitator in a yellow apron if you have questions about how to get started or need assistance working with the activities. The Hub (center tables) offers a “make and take” activity, but all other supplies and activity components/equipment should remain in Spark!Lab at their appropriate stations. Please note that on particularly busy days, the Hub may be replaced with the Thinking Spot. Check out The Hub Challenge link in the black box to learn how you can take this fun activity into the classroom! The Thinking Spot is recommended for quieter activities like sketching, reading, and exploring new ideas. Spark!Lab is designed to foster intergenerational and collaborative learning. Adults should stay with their children while in Spark!Lab and actively participate in the invention process with them. Children under the age of 12 may not visit Spark!Lab without an adult. Food and drink are not allowed in Spark!Lab, but you may have bottled water. Please gather your group and belongings together before leaving Spark!Lab to ensure that children are not left behind without adult supervision. A facilitator may ask if we can follow up with your class through a quick survey via email, or you can feel free to email us with your comments at SparkLab@si.edu. Your feedback is appreciated as we are always working to improve the Spark!Lab experience. Share your experience with us on social media! Take a picture or video of your students and their inventions and use #SparkLab. Please feel free to email us at SparkLab@si.edu. We look forward to seeing you in Spark!Lab!